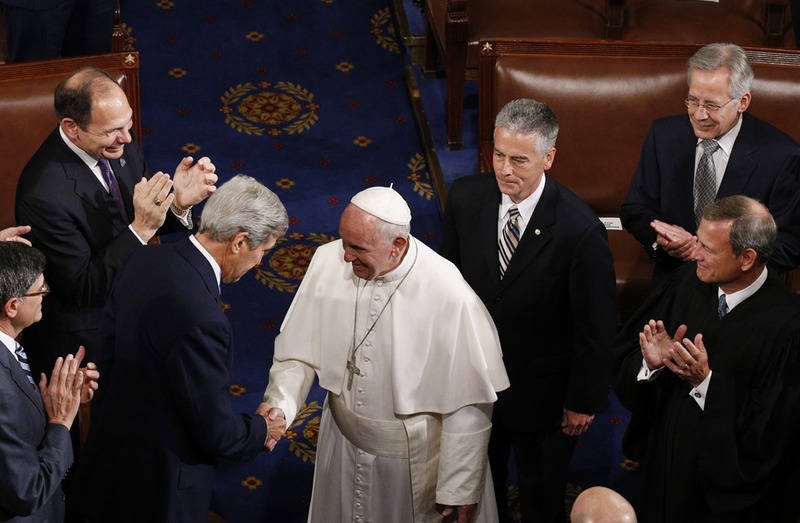 This is been a very exciting week, to say the least! 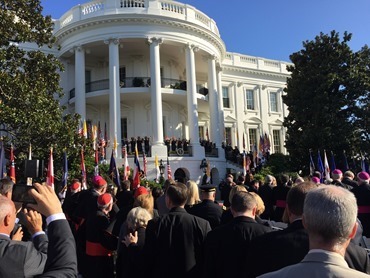 I’m sure all of you have been following the details of the Holy Father’s visit to Washington D.C., New York and Philadelphia, which has been an important moment for us. 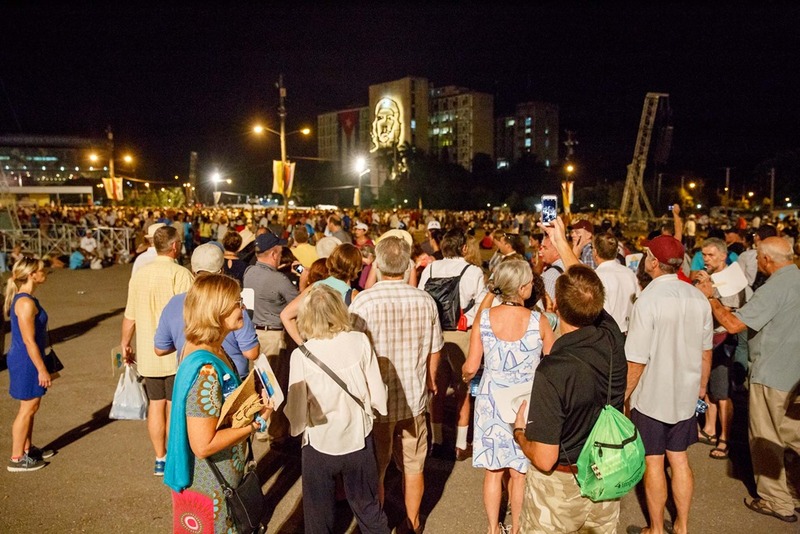 Of course, before the Holy Father arrived here in the States, he began his journey in Cuba, and last Friday I was very happy to be able to join a group of about 100 pilgrims in Boston who traveled to Havana to be with him for it was also his first visit to that country. 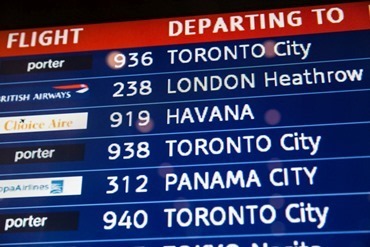 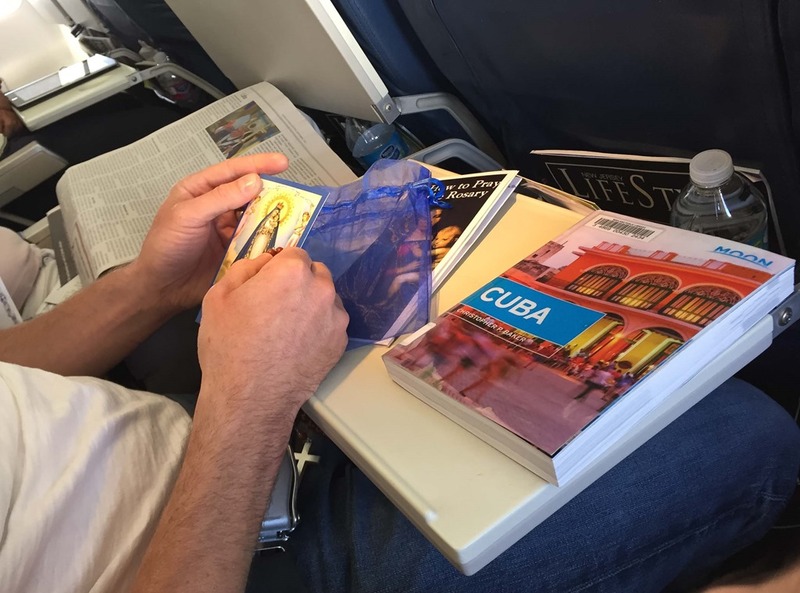 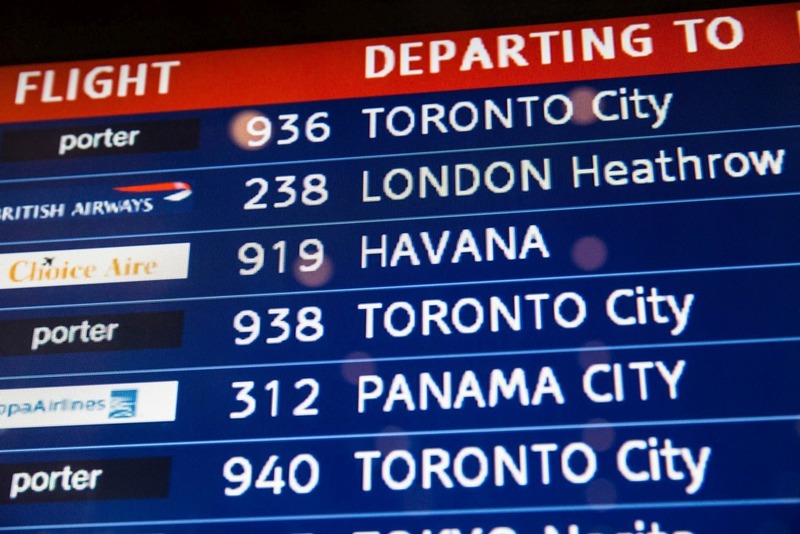 We departed Friday morning from Logan airport on what they tell me was the first flight from Boston to Havana since the Cuban revolution. We had a wonderful group of people including Cardinal Theodore McCarrick who had learned about the trip and wanted to go with us as well. 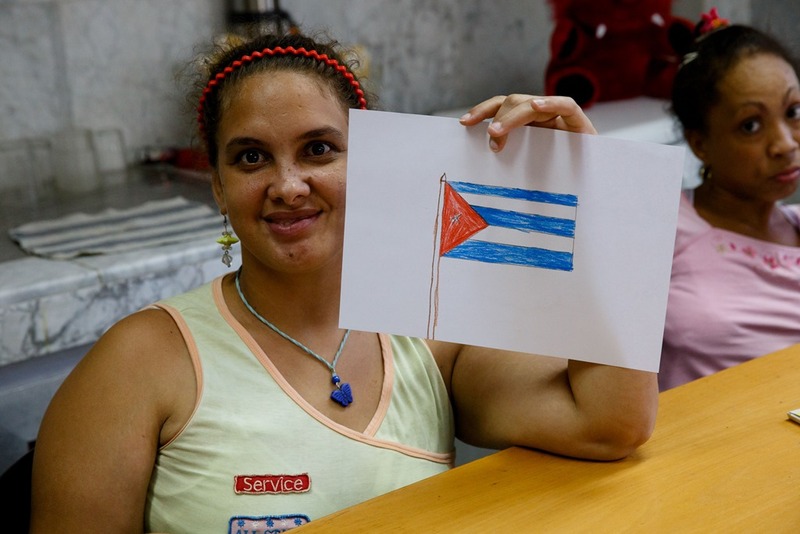 Saturday, our first full day in Havana, was something of an immersion into the culture of the Cuban people. 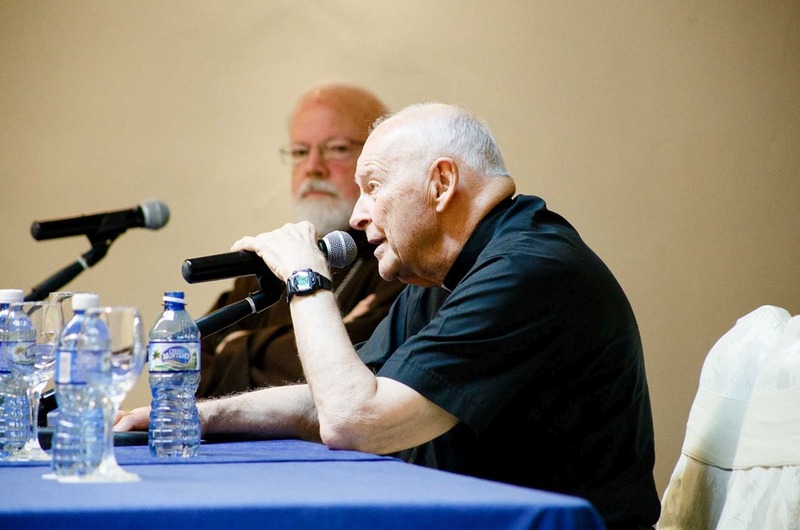 We began the day with a talk by me and Cardinal McCarrick, speaking a little bit about the history of U.S.- Cuba relations and our experience visiting there over many years. 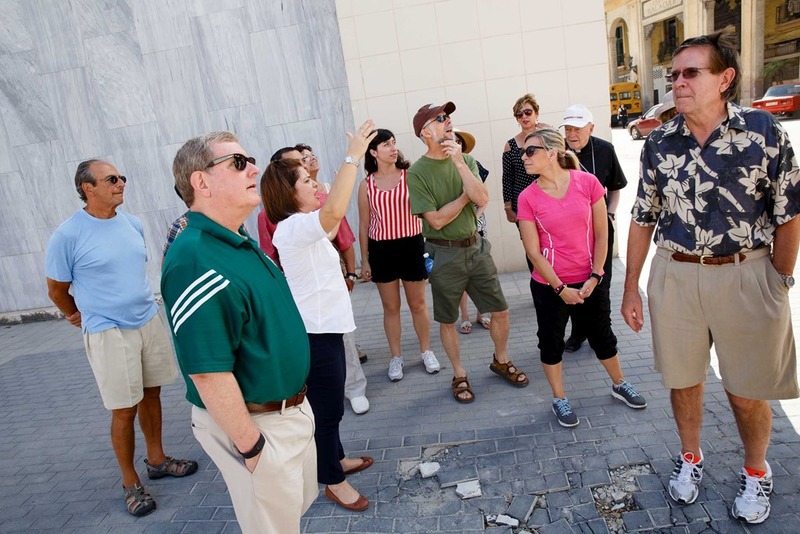 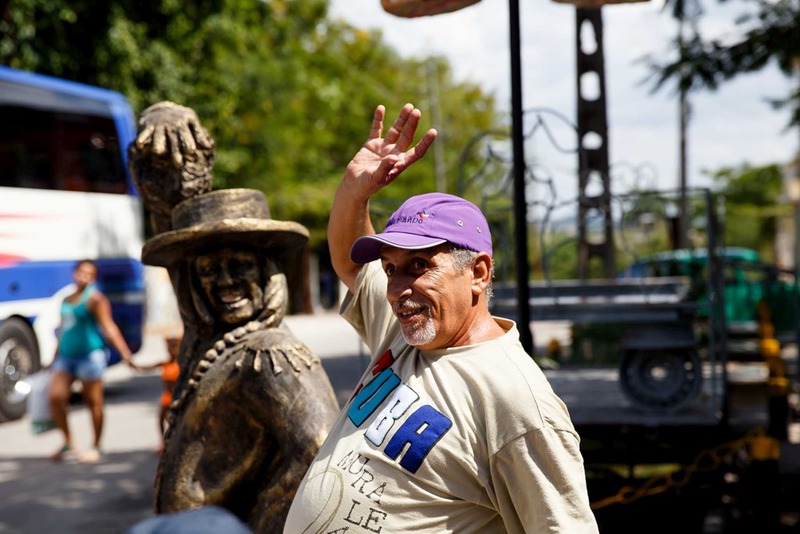 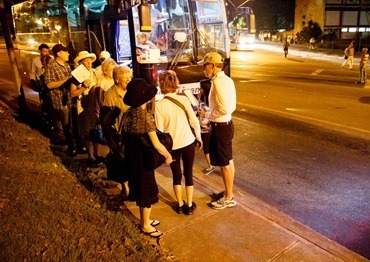 Then the pilgrims had an opportunity to see a little bit of the city by bus on their way to various cultural sites such as the Havana Museum of Fine Arts, and an arts center called Muraleando, which has worked to revitalize the Havana neighborhood of Lawton through public arts and community projects. We also had a performance by a cappella chorus, Coro Luna, which was just stunning. On the way from place to place the pilgrims had an opportunity to meet some of the local people and talk to them. They were warmly greeted wherever they went. 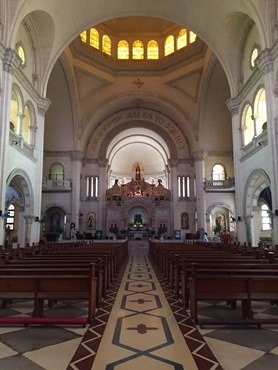 The interior is stunning and very much like the capuchin church of Medinaceli in Madrid. 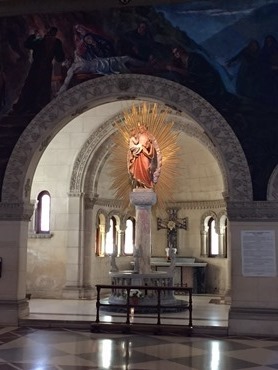 It contains a large statue of Christ and under that, a statue of the patroness of the Capuchins, Mary, Mother of the Divine Shepherd. 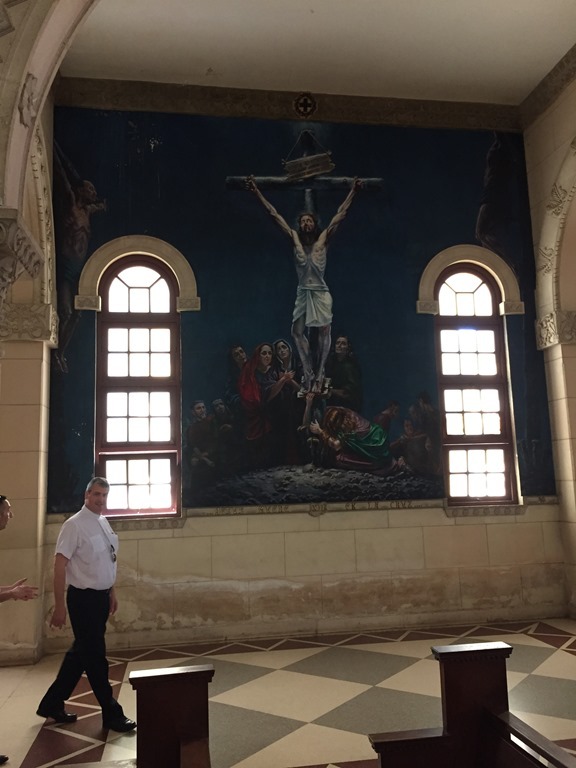 One beautiful feature of the church are the stations of the cross, which are done in murals that are larger than life-size. 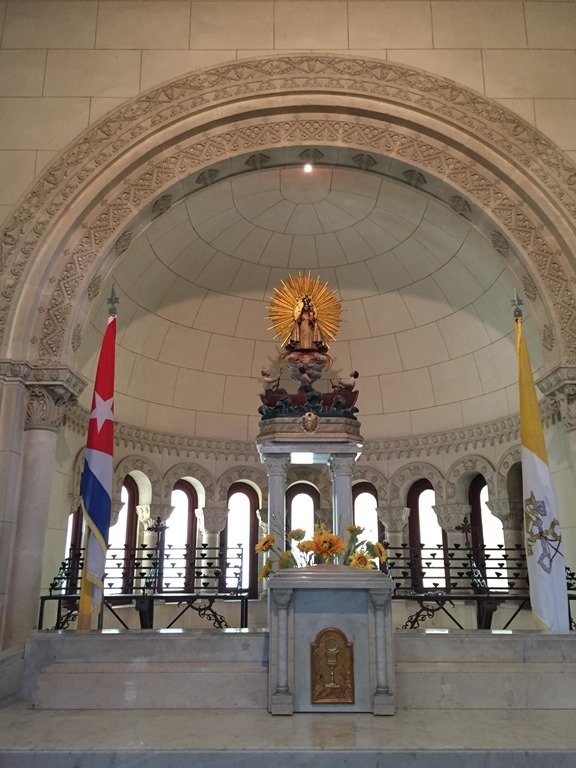 There are also many shrines including one to Our Lady of Charity of El Cobre, the patroness of Cuba. 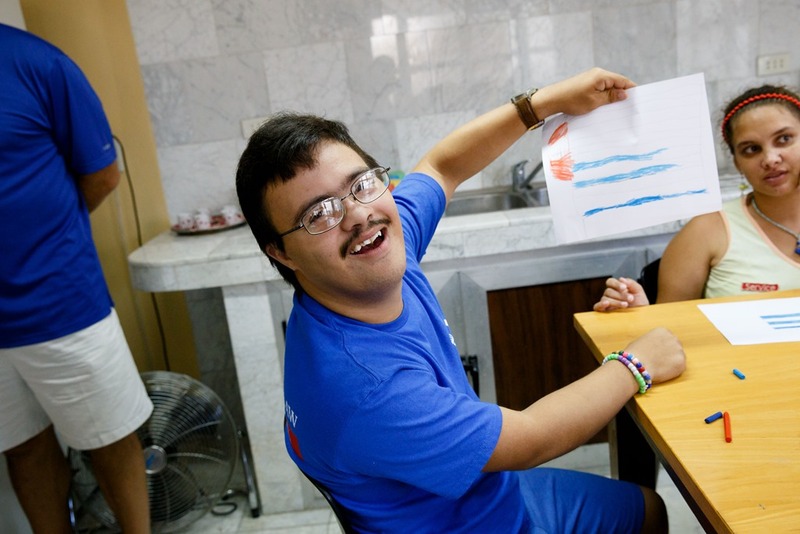 At Jesus de Miramar, they have a program for autistic children. 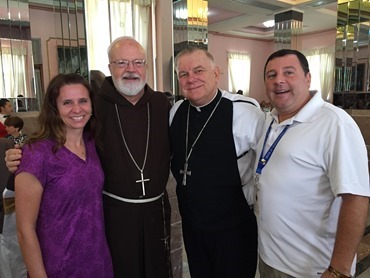 The main group visited another parish where they have programs for the elderly and special-needs children, as well. 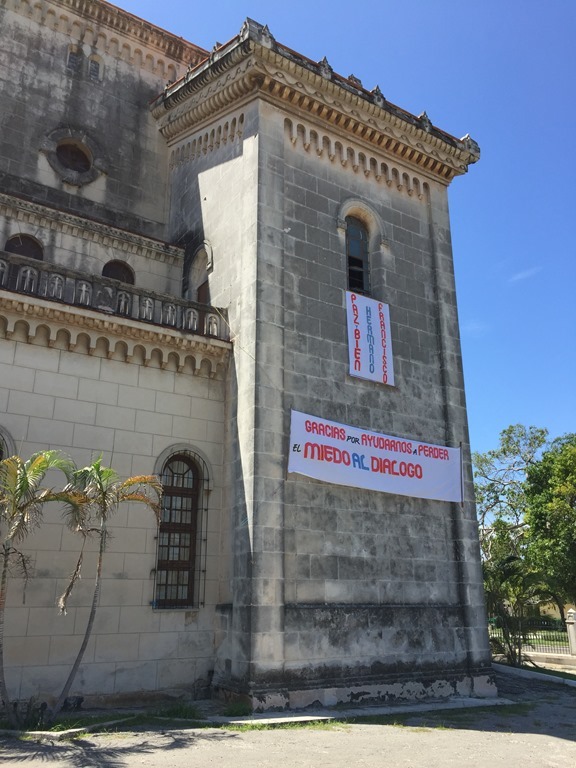 Although the Church is officially forbidden from running any social programs, in the last few years the government has given the church a little more space to operate and so many of these programs are carried out with help from groups like the Order of Malta and the Friends of Caritas Cubana in Boston. 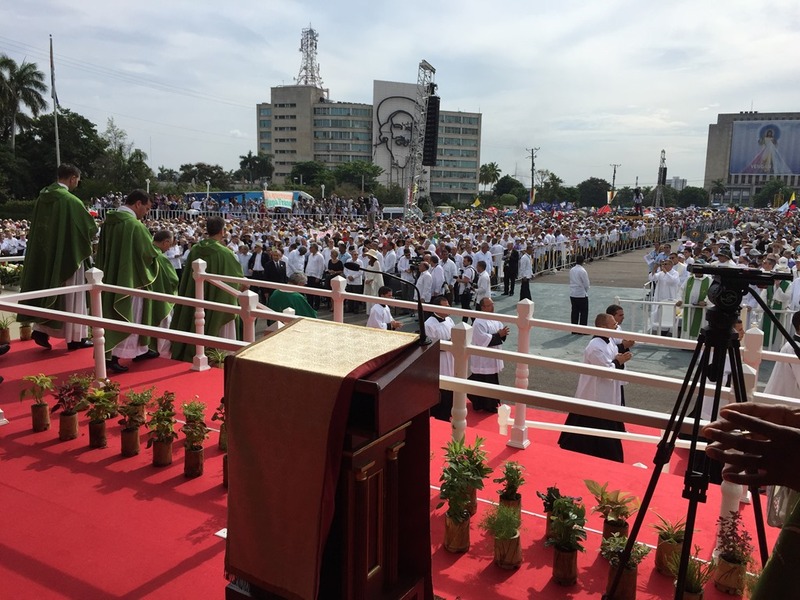 Sunday of course was the Papal Mass in Revolution Square. 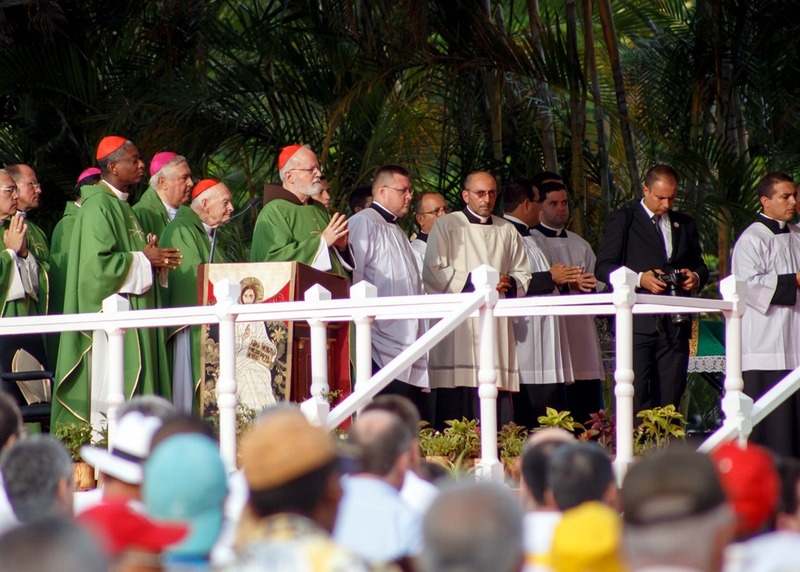 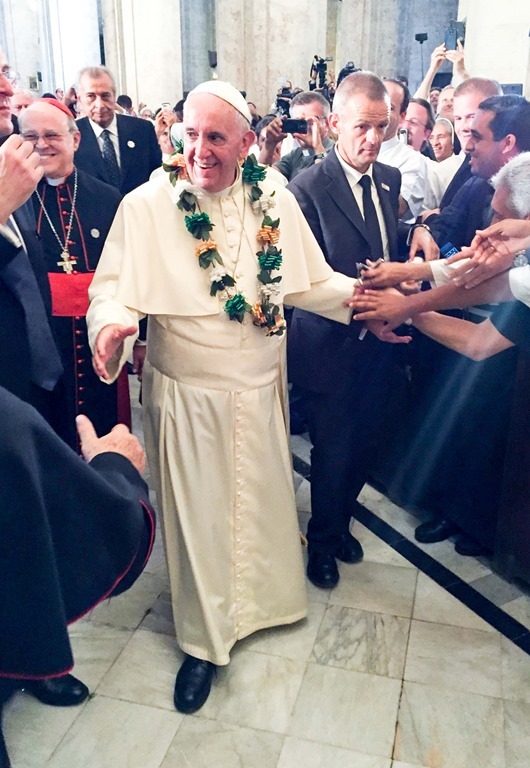 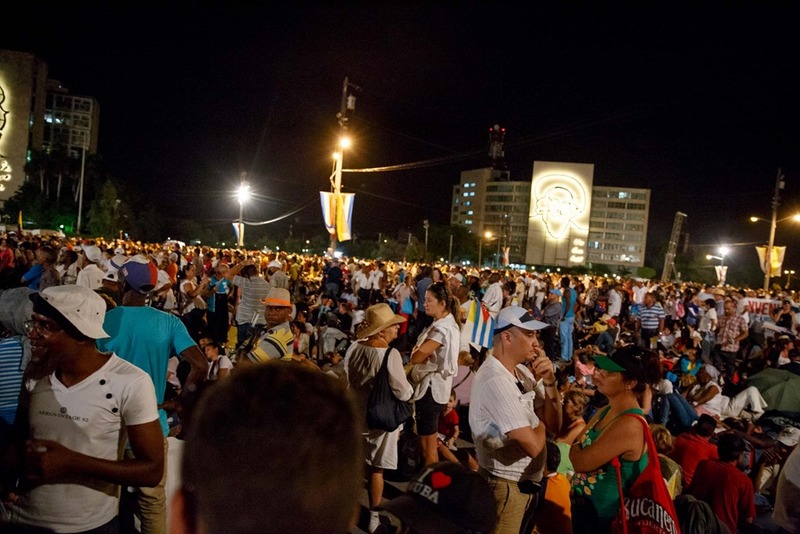 It was so impressive to see so many hundreds of thousands of Cubans anxious to be together with the Holy Father. 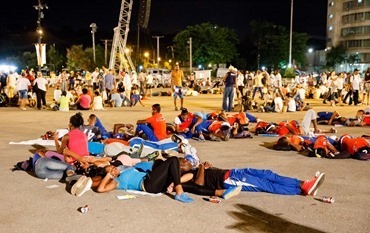 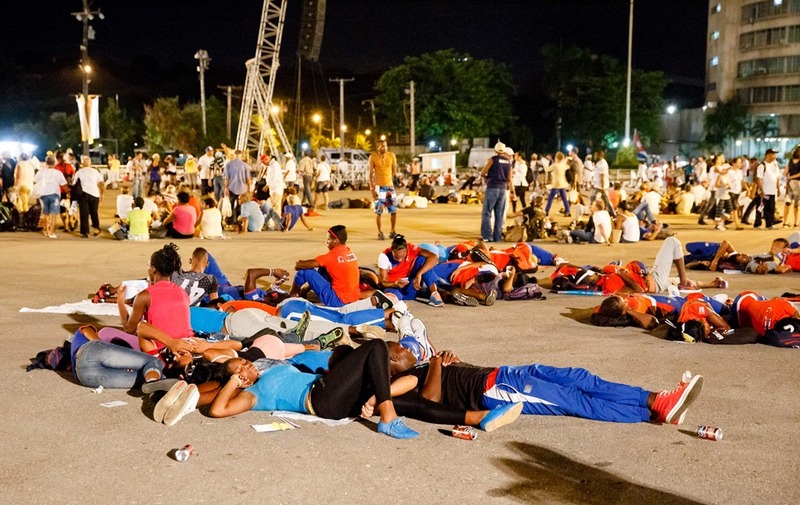 Some of the pilgrims recounted to me that, when they arrived at 5 a.m. for the Mass, they found the square full of people sleeping on the asphalt, many in their Sunday best, just for a chance to perhaps catch a glimpse of the Holy Father. 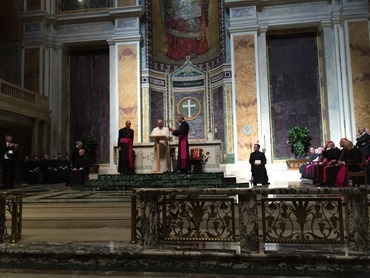 The Holy Father’s message at the Mass and throughout his trip was very well received. 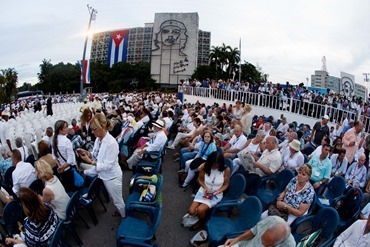 As I have said, in all the 30 years I’ve been going to Cuba I’ve never seen as much enthusiasm on the part of the Cuban people. 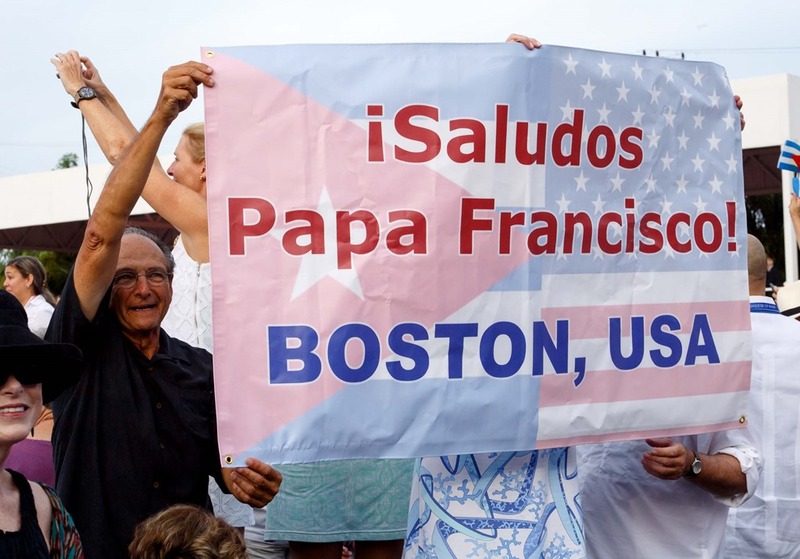 They are truly filled with hope and they are so grateful for the Holy Father’s intervention to help normalize relations with the United States. 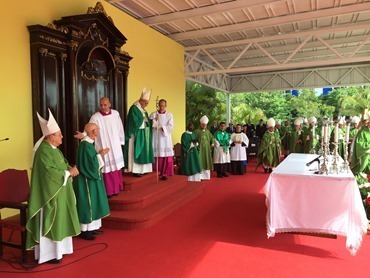 As one of the Cuban bishops told me, it’s very hard when you don’t get along with your next-door neighbor, and this has been their history for decades. 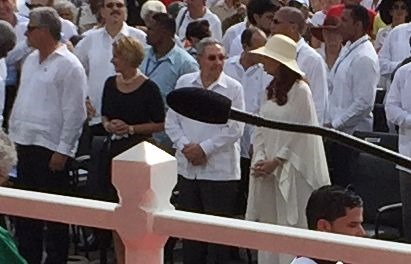 In this picture, if you look very closely, you can see Raul Castro and Christina Kistner, who were in the front row at the Mass. We are so grateful to the archdiocese of Havana, which treated the so well and was so gracious in providing seats for our group. 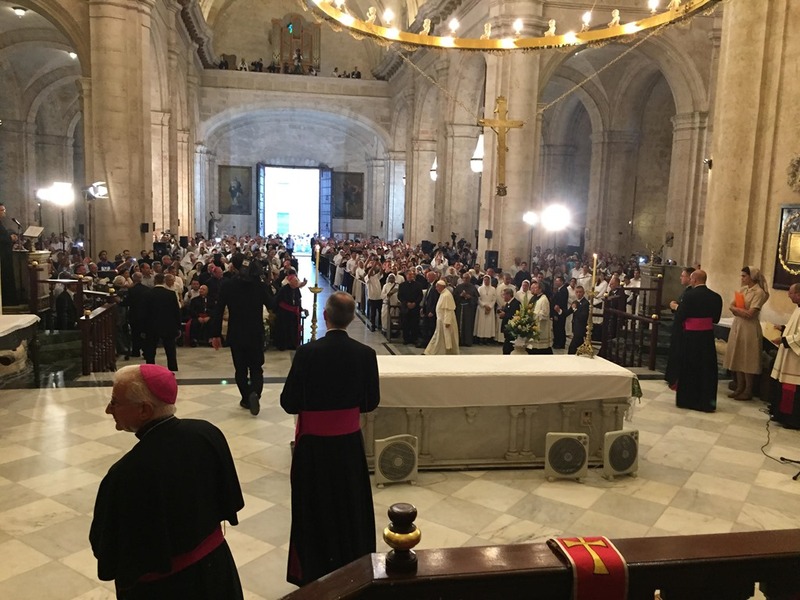 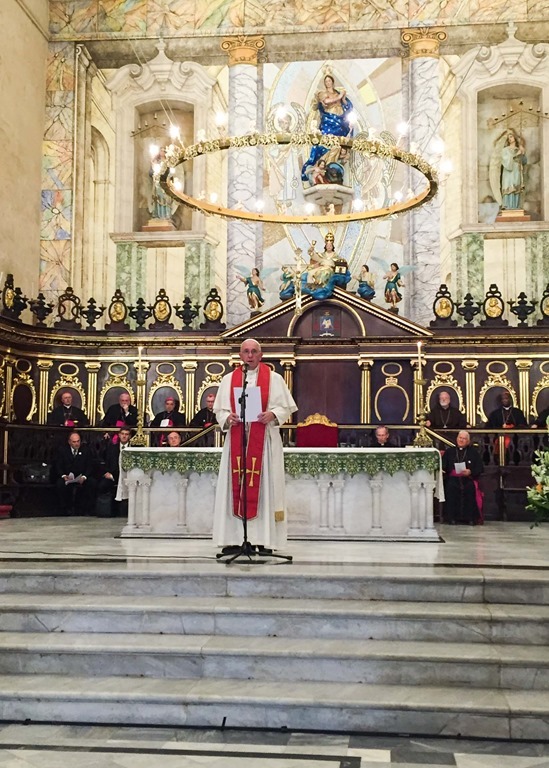 That same evening, the Holy Father held a Vespers service in the Cathedral of Havana for priests, deacons and religious. 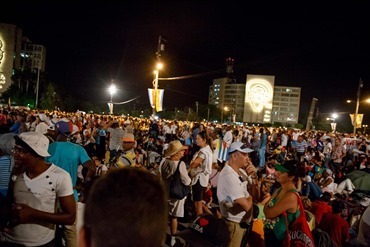 After the Vespers, the Holy Father immediately went out to a platform behind the Cathedral where he addressed a rally of several thousand youth. Despite the fact that rain began shortly after he began speaking, the Holy Father gave a beautiful talk. 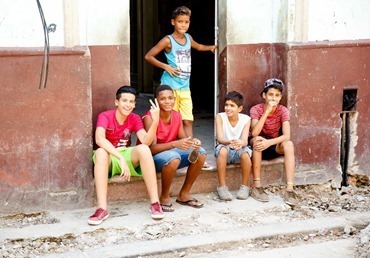 He challenged them to work together for the common good and have the courage to dream of a better world and to make the world a better place. 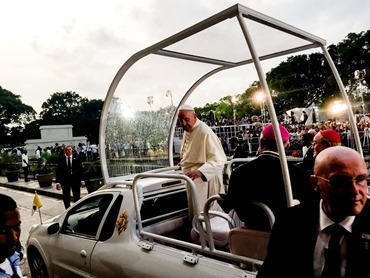 After he spoke with them, he departed in the Popemobile and drove through the crowd of young people. 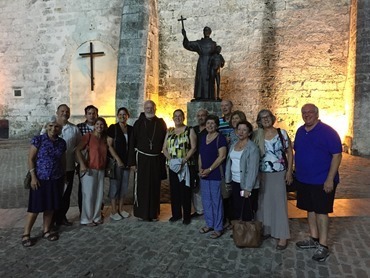 Along with our group about 100 people from Boston, also in Havana was another group of about 300 from Miami who were traveling with Bishop Wenski. 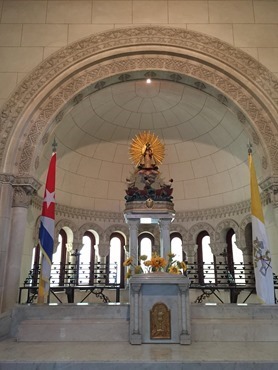 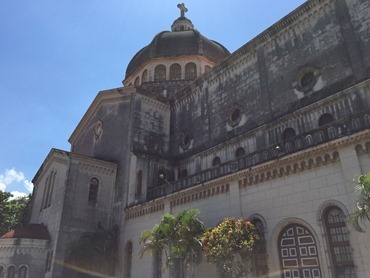 So, on Monday, we had Mass at the Carmelite convent in Havana for both groups together. The Carmelite sisters are honoring the 500th anniversary of the birth of St. Teresa of Avila, and so it was very nice to be able to join them for their time of celebration. 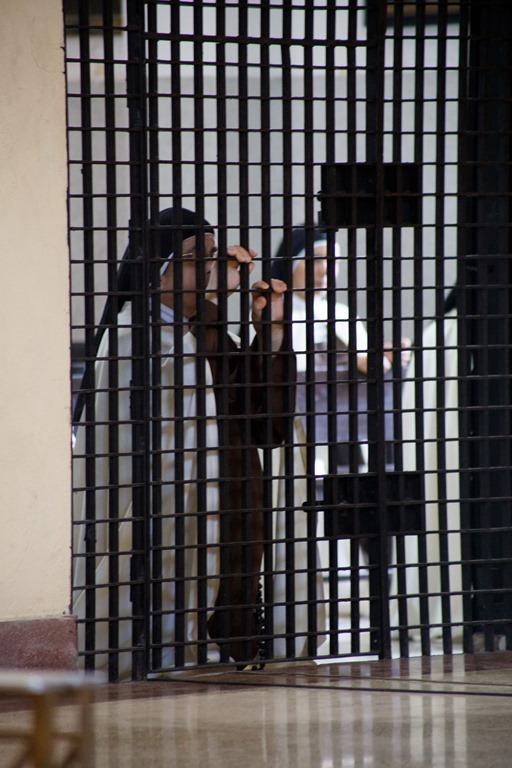 During the Mass, the sisters remained behind grate, but afterwards before leaving each of the pilgrims an opportunity to come up to greet them. 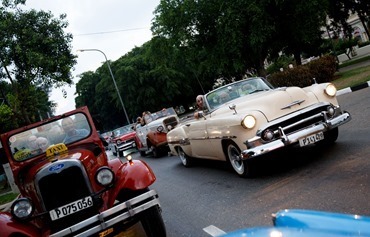 That night, the final night of our trip, we were taken to our farewell dinner in these antique American cars, which are most often used as taxis now in Cuba. Of course, we all think of these cars we think of Cuba, but they also serve as a reminder that, because of the US embargo, the Cuban people have been unable to receive many goods that are not produced on the island. 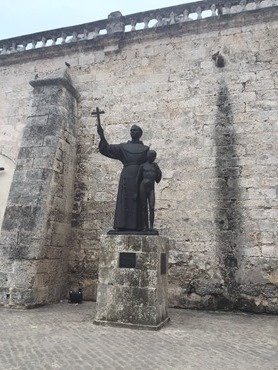 Our new saint, St. Junipero Serra, lived in Havana and there is a large statue to him outside the church of San Francisco, which is no longer used as a church but as a concert hall. I met with Stephen Kari Colella and Bishop Wenski of Miami. 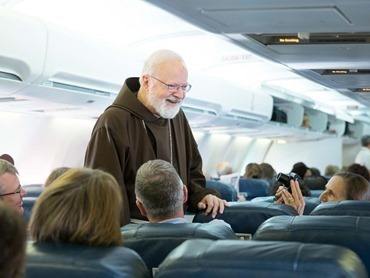 On Tuesday we returned to Boston on a charter flight for the Boston pilgrims, and turned around and took plane to Washington to arrive that night. By 6 a.m. Wednesday morning we were on our way to the Rose Garden at the White House. 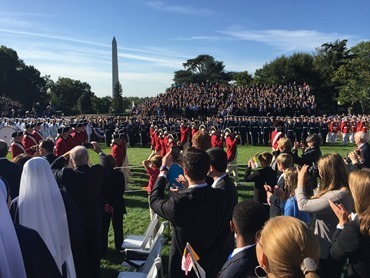 It was quite a grand spectacle with a military salute, colonial soldiers and a drum and bugle corps. 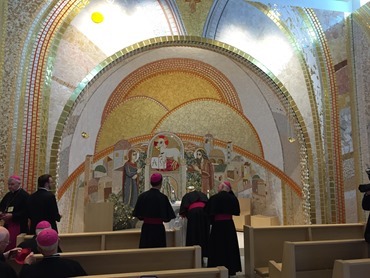 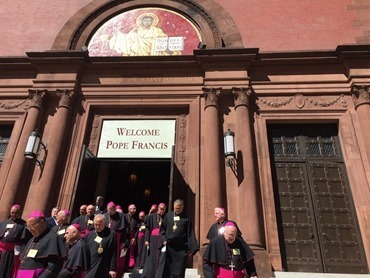 From there we went to St. Matthews Cathedral where the Holy Father met with the bishops and addressed them with a wonderful, challenging talk urging them to be close to the people and be pastors to them. 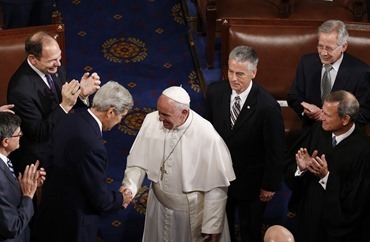 I found it a very encouraging and fraternal talk. 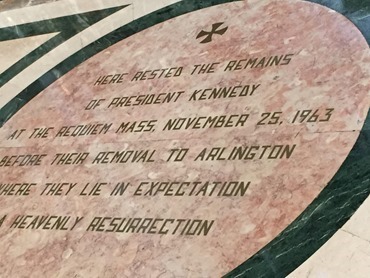 In the center of the Cathedral is a marker indicating where President Kennedy’s remains rested during his funeral Mass. At the gathering, the staff of the bishops conference presented the Holy Father with an image of the North American Saints. Then the bishops were invited by the Knights of Columbus to the shrine of John Paul II for lunch and to be able to visit the Chapel there. 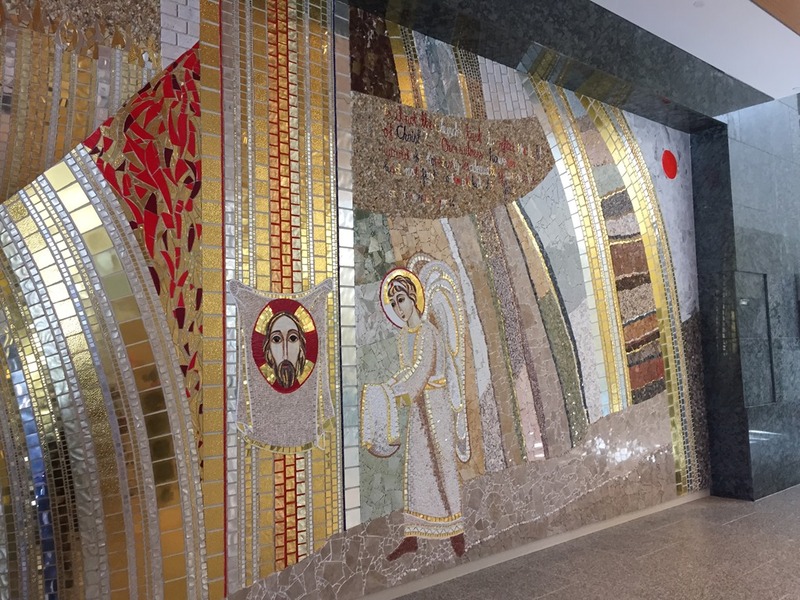 There many beautiful Rubnik mosaics in the Chapel which I always find very inspiring. 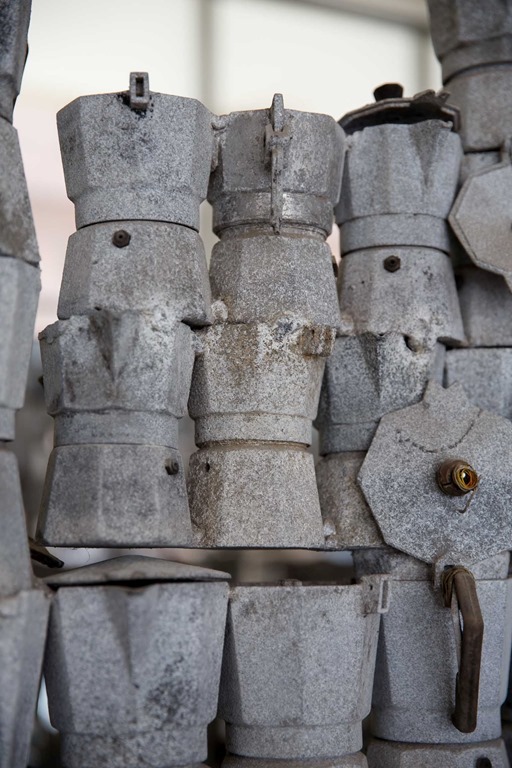 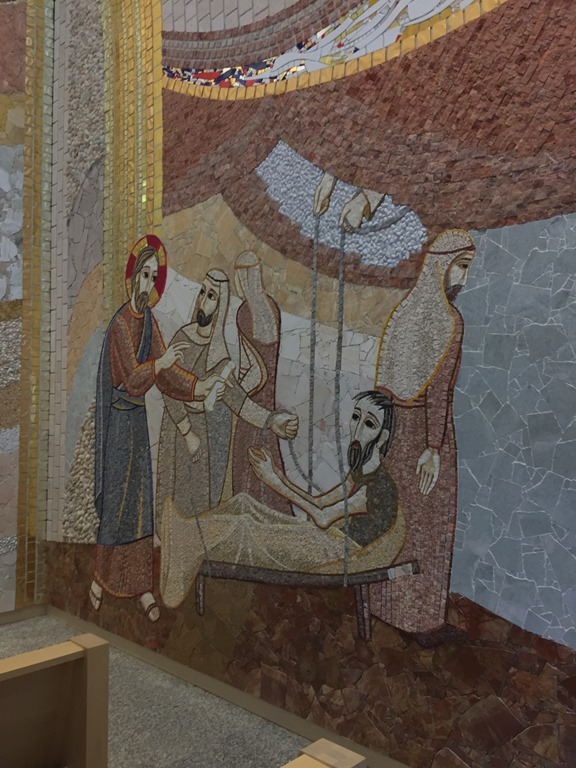 They include scenes such as the wedding feast at Cana and one that depicts one of my favorite episodes in the gospel – the paralytic being lowered through the roof of St. Peter’s home on ropes. There is also a life-size statue of John Paul II, which is very striking. It is perhaps the most lifelike image of the Holy Father I have ever seen. 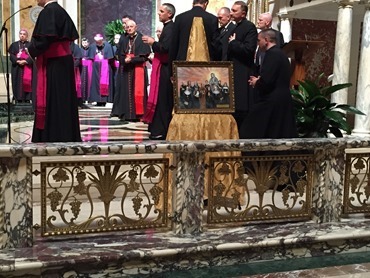 The bishops venerated the relic of John Paul II under the image of the Lamb. 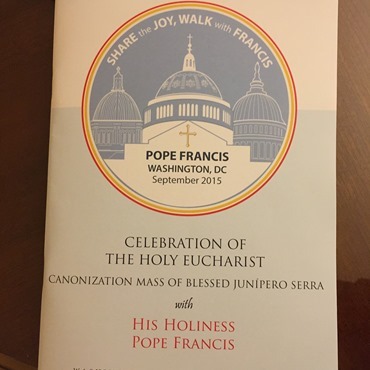 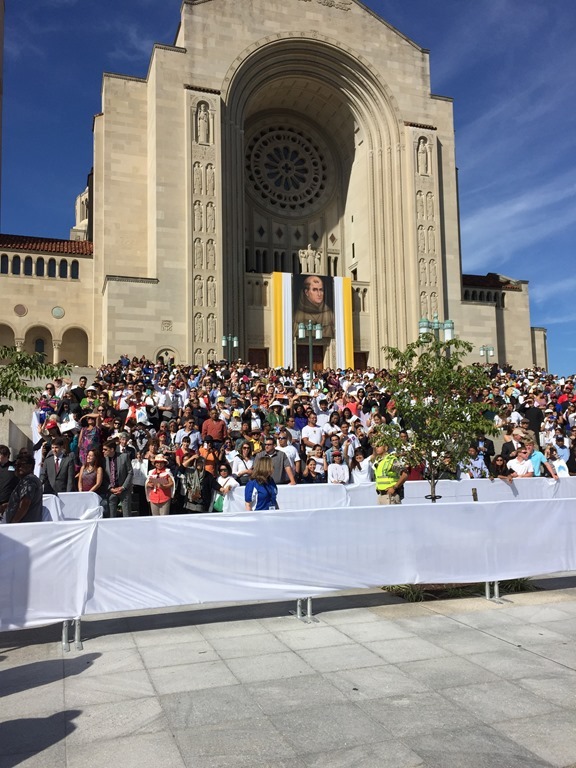 Wednesday, was the canonization mass for St. Junipero Serra, held on the grounds of the Catholic University of America. On the Basilica, they had a very large image hanging of St. Junipero Serra. While the mass was held outside, inside the neighboring Basilica of the Immaculate Conception, there were almost 4000 seminarians, novices and religious in formation. 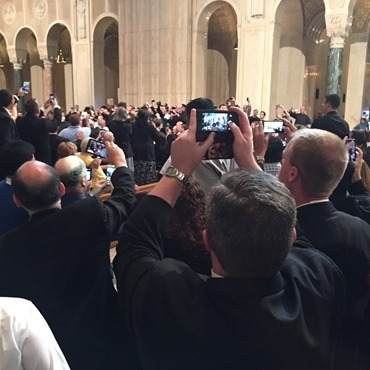 The Holy Father greeted them before the Mass and then they watched the canonization Mass on screens in the shrine. I was so pleased that they had them come to the shrine. It was such an impressive sight to see all these young people who had responded to the invitation to give their life to God. 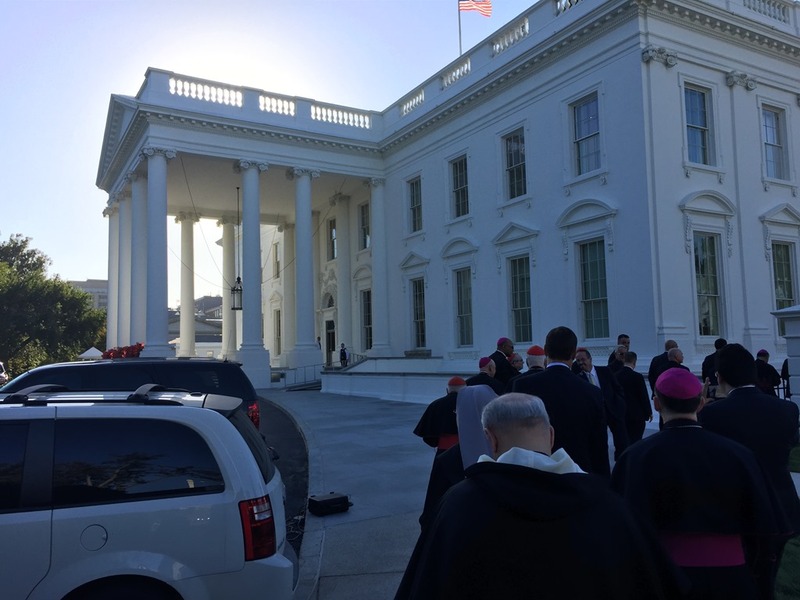 This was Archbishop Vigano’s idea and I think was a brilliant one. It was a great source of encouragement but was also a great witness to the young people of America about generosity in responding to a vocation. The canonization Mass was a magnificent celebration. 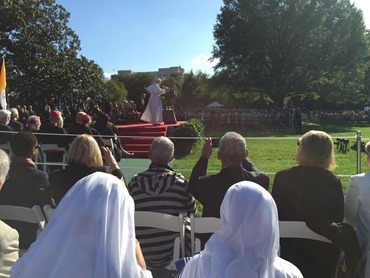 The weather could not have been more beautiful. 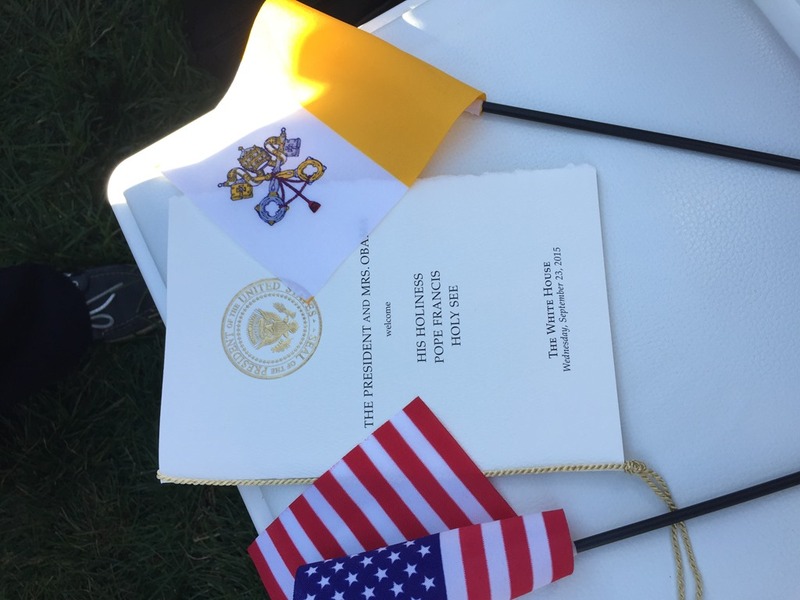 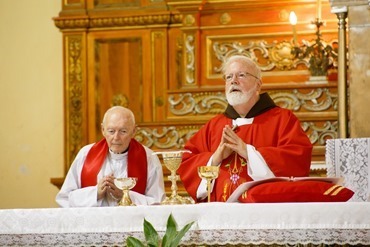 There were about 25,000 people there, and I would say virtually all the students at Catholic University were present as well as many other invitees, including the Father General of the Franciscan Order. Yesterday, was of course the Holy Father’s address to Congress, which I think was just an extraordinary tour de force. 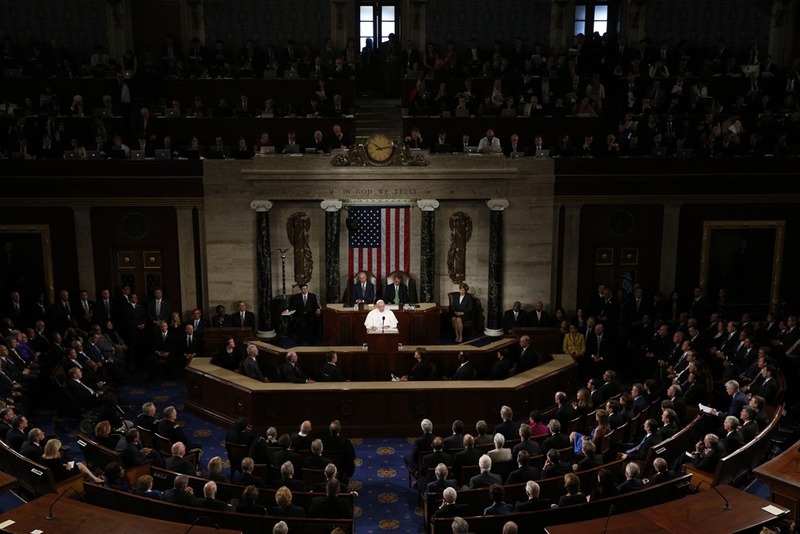 He said that in addressing the Congress he wanted to address the American people and the Congress is the face of the people, whose task is to defend the dignity of the people and to live in a tireless pursuit of the common good, which is the aim of all politics. 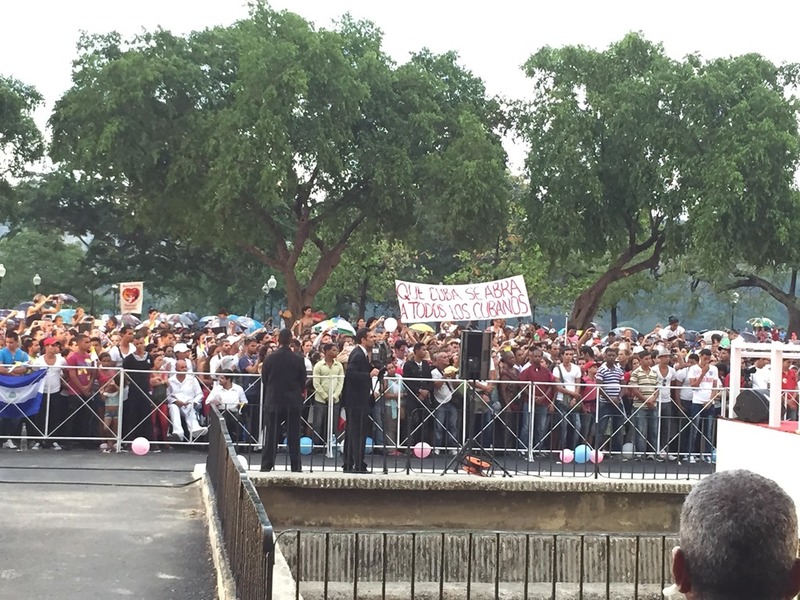 He said especially the test must be to defend the vulnerable. And then he pointed out image of Moses on the wall the House of Representatives and said that Moses was the great lawgiver of Israel, whose duty was to bring unity to God’s people by giving them the law – the law that leads them to God and that defends the transcendent dignity of every human being. The law that Moses gave was to protect the image and likeness of God in each person. I think the Holy Father in pointing to the image of Moses was, in a subtle way, reminding us of the spiritual roots of our democratic institutions. 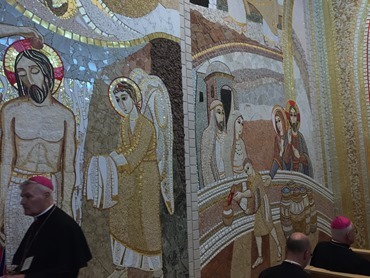 He also spoke of the need to support families, as they sustain the life of society, generate solidarity and help those in need. He also spoke of the elderly as the storehouse of wisdom. 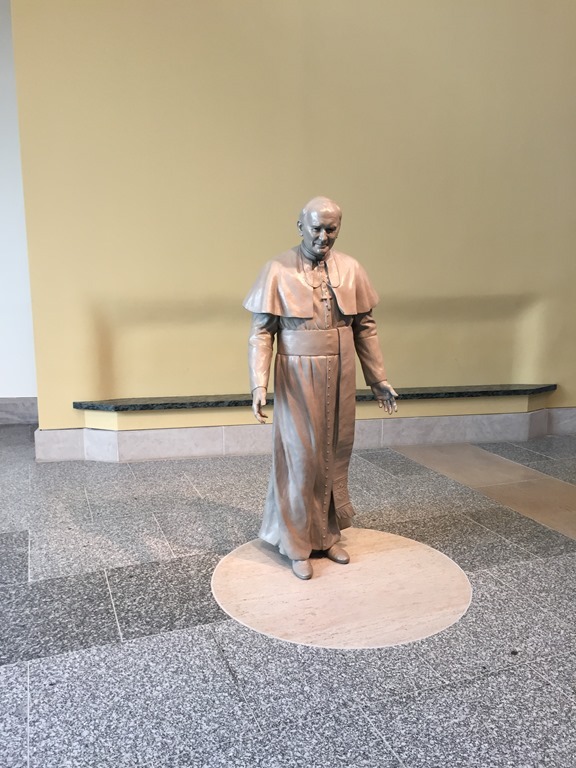 Then, he very artfully spoke of four different Americans from whom he gleaned inspiration: Abraham Lincoln, Martin Luther King, Dorothy Day and Thomas Merton. 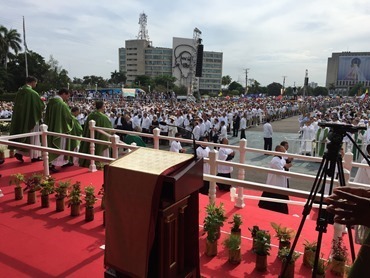 He talked of these individuals as being defenders of liberty and social justice and our capacity for dialogue and openness to God and for social justice. 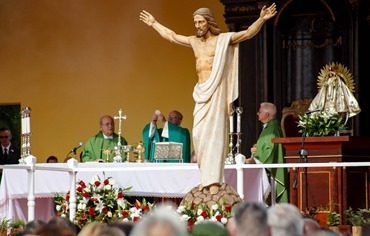 It was a very beautiful exposition. He also spoke of the need to defend life and there was a great spontaneous applause and many rose to their feet. 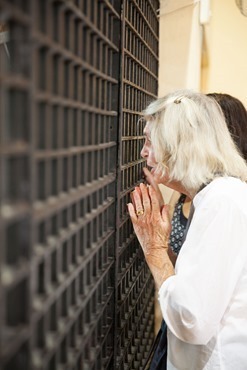 He went on to make a long appeal for the global abolition of capital punishment, saying that there must be hope in the ability to rehabilitate prisoners. 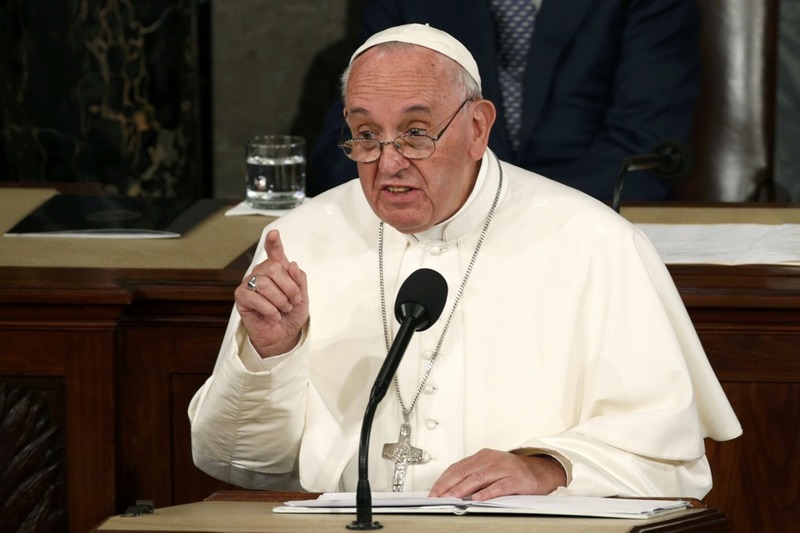 He also spoke of about the evil of the arms trade. Returning later to the theme of the family, he said the family was essential to the building up of this country, and said that never before has the family been as threatened as it is today. 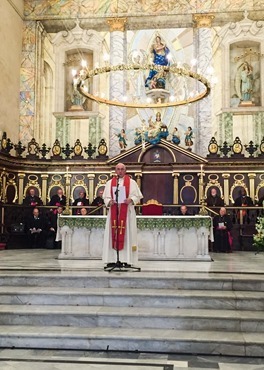 He spoke about the most vulnerable, the young who are disoriented and trapped in a maze of hopelessness. 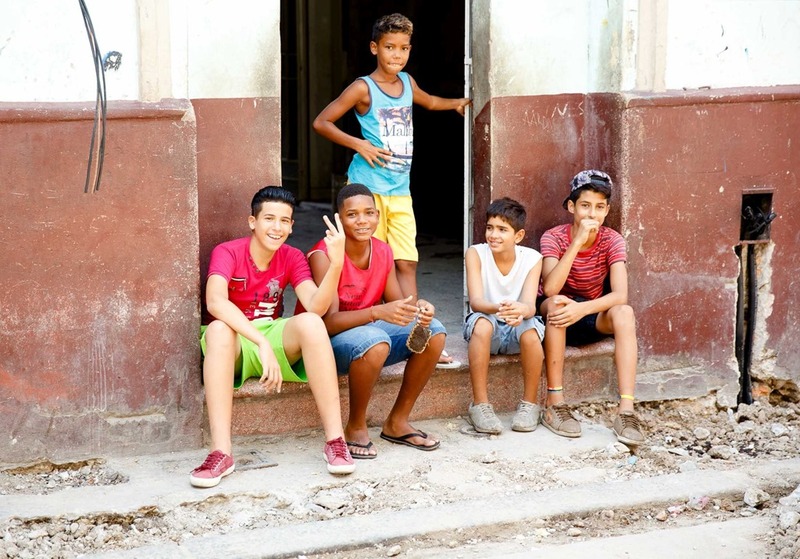 He said that their problems are our problems. 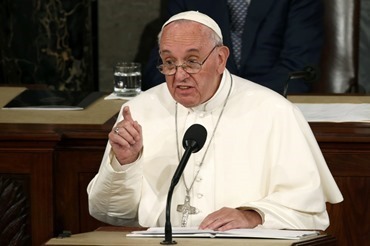 And he spoke about the pressure on people, because of their poverty and lack of opportunity, that leads them not to start a family. 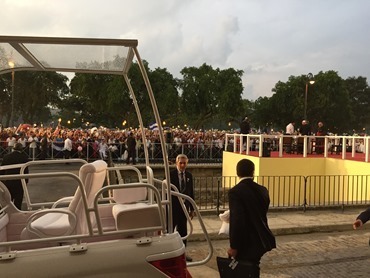 But, he also said that, on the other hand, there are some people with so many opportunities and so much material wealth that that also dissuades them from starting a family. 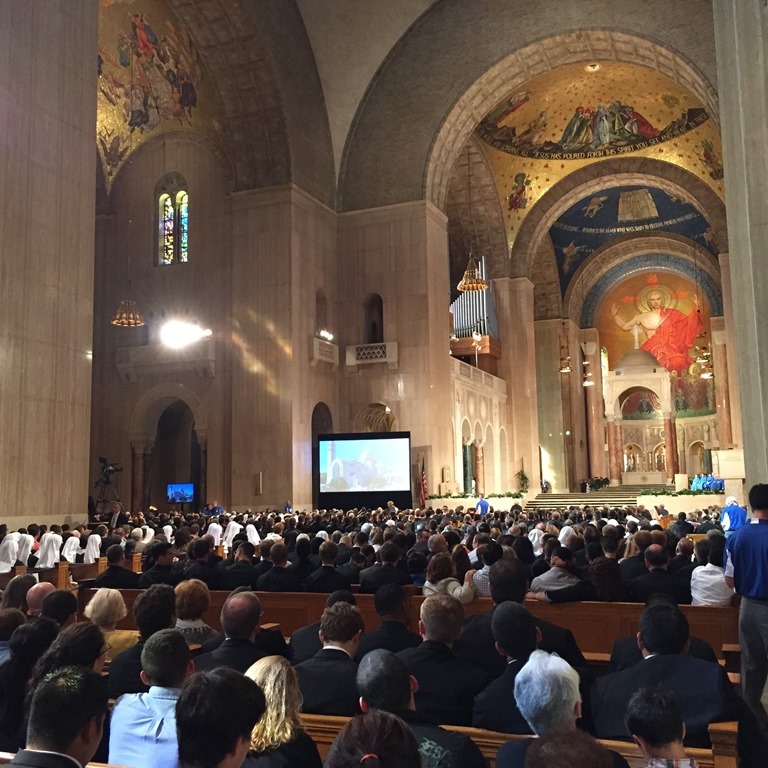 He spoke of his desire to hold up the richness of the culture of the United States and challenges to continue to inspire others to dream. It was a very affective and moving talk. 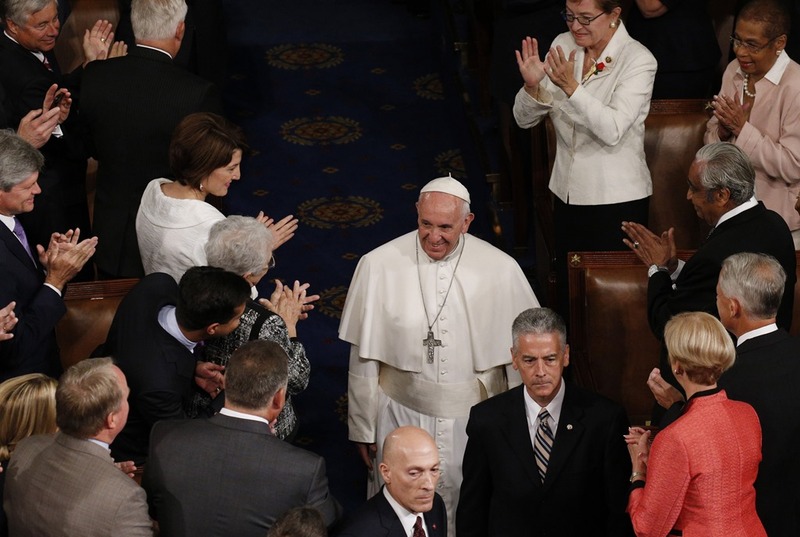 The speaker of the house was visibly moved and I heard that many people were moved as well. 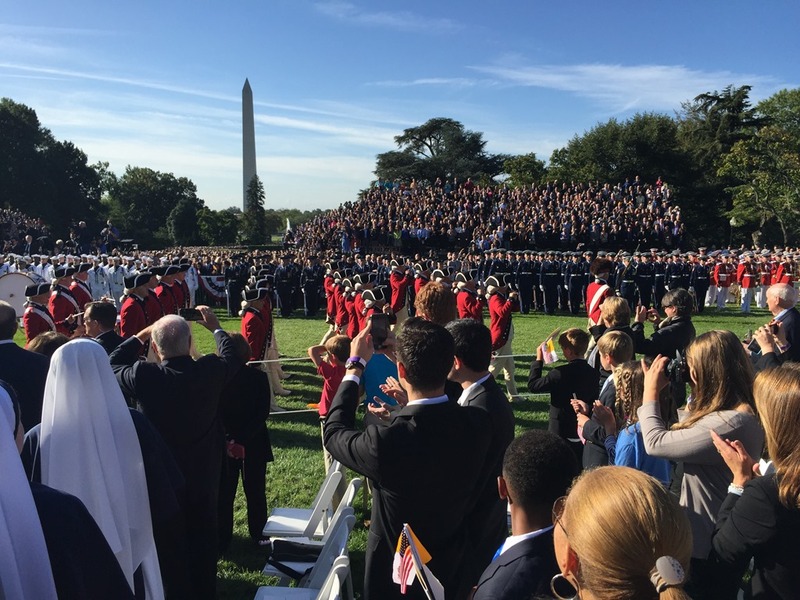 It was just extraordinary. 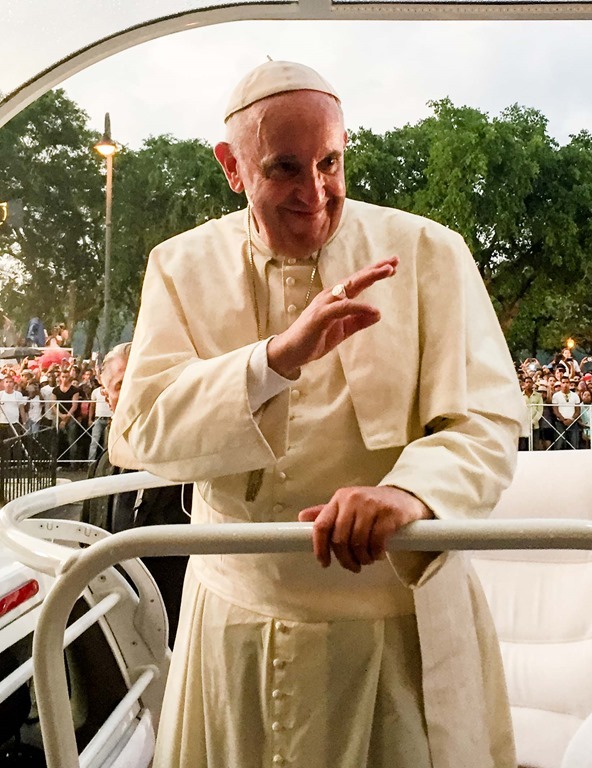 What the Holy Father likes to do is to present Catholic themes and look for ways to weave it into a larger cultural view. 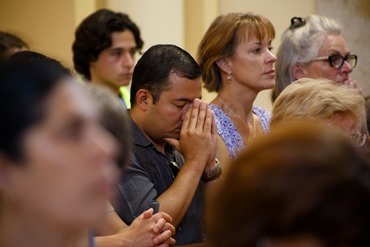 For example when he speaks of the sanctity of life, and some of those issues can be very divisive, but is showing that the church is position is very consistent. 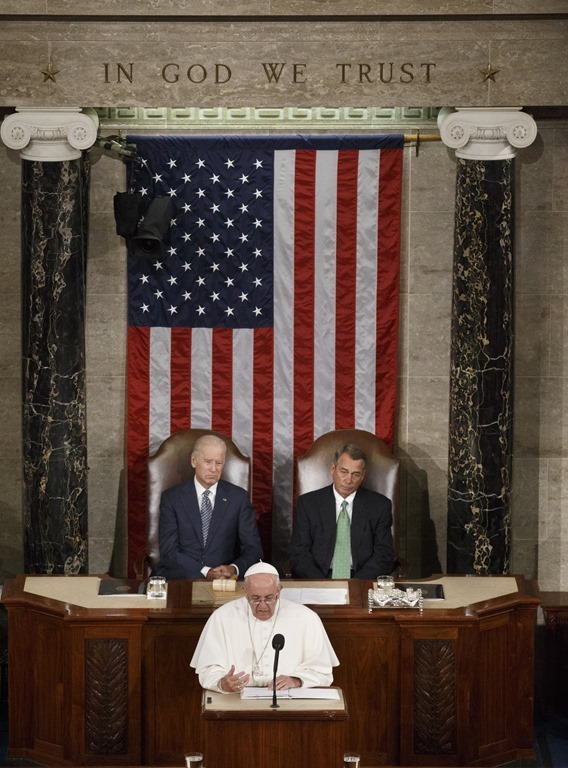 So consistent, that we oppose capital punishment. I think his address was a wonderful moment for the Church in our country. 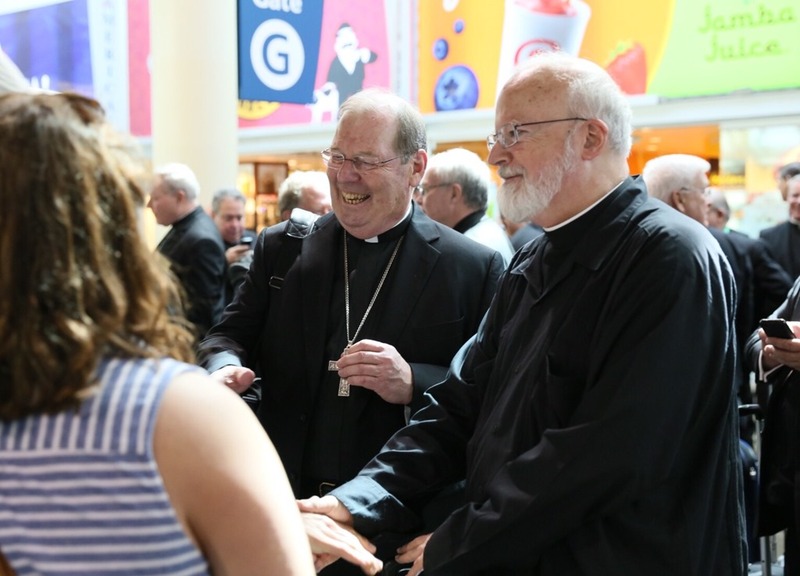 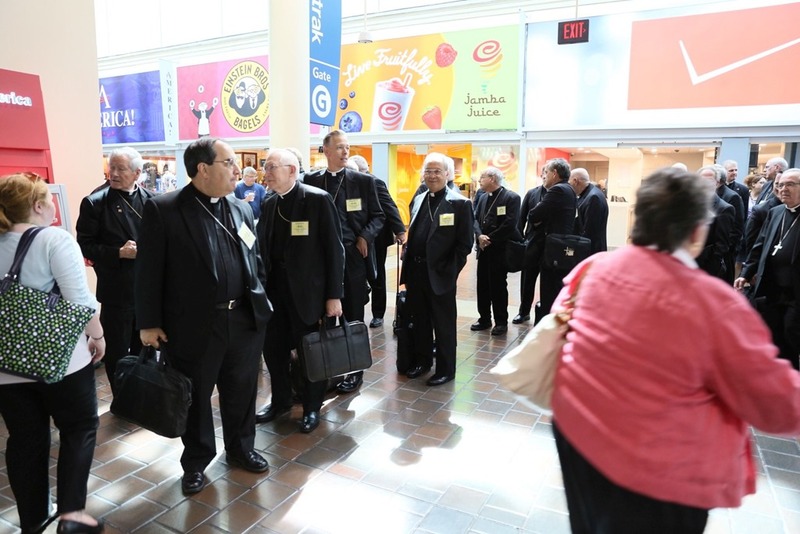 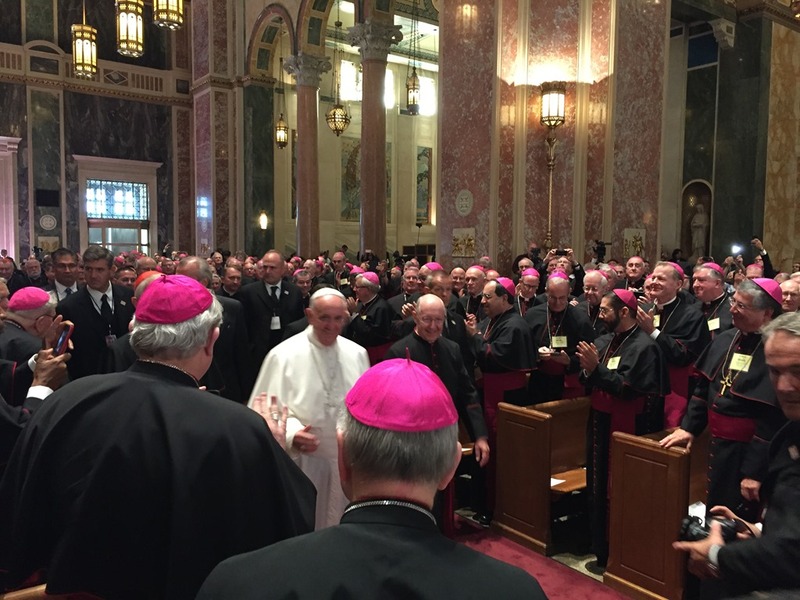 That afternoon the bishops took a train to Philadelphia participate on the World meeting of families and the events with the Holy Father there scheduled for the weekend.